On World Delirium Awareness Day, I have been reflecting on my three weeks in ICU three years ago. I suffered from delirium and it wasn’t until recently that I discovered that that’s what it was called. I was 28 years old when I was admitted to ICU. I have no memories of going to the hospital, just of having a virus leading up to it. While the world was going about its business, I was living in another world – my ‘dream state’ as I call it. I didn’t know what was going on in the real world, but my body was trying to make sense of the things that were happening to me while I was sedated. I believed I was being hunted down and tortured by a group of people looking for my family. In this state, I would escape for short periods of times and be with my family before being recaptured. Looking back, it all seems unbelievable but it is your brain that’s telling you it’s real at the time. When I look back, every transition in my dream state can be linked to a drip being inserted, a biopsy taken or other medical procedure being performed. Delirium is like a thief in the night. Prior to having delirium I had no issues with mental health, cognitive or memory issues. Before I even left the hospital I already suffered with depression, as well as developing panic attacks and PTSD. It stole my short-term memory and my ability to concentrate for any length of time. These issues are not fully resolved. In the time immediately after delirium you are not sure what is real and what’s not. Sometimes you will have a physical reaction to people who might be looking after you but in your dream state, might have been your torturer. Even now, three years on I still have memory and concentration issues and while I no longer have panic attacks, I get anxious more often. This all came from fighting for my life, both in my dream state and real life. A better understanding of delirium is crucial for everyone involved in care, as often the problems post delirium are not understood and can cause issues between the patient and family and friends. However, awareness is not just for the public, a better understanding by medical professionals is also needed, as while most understand when a patient is suffering from delirium, they are unaware of its after effects. Raising awareness of delirium is also important, because having the condition can be very scary and a lonely place for a patient. If you are aware of what delirium is, then you can understand why you or your loved one acts a certain way or avoids certain places or situations. It can explain why they seem depressed, why they are panicking. Delirium can affect anyone. It is not just ‘an elderly person’ issue. Delirium can be caused by a whole host of things like infections, sepsis, constipation, sleep deprivation and medications. No one is too young, too healthy, too fit or too anything to get delirium – it is an equal opportunity thief. These quotes show how traumatic the experience of delirium can be for patients and their families. Delirium is a common and distressing medical emergency, affecting at least 15% of patients in hospitals. Until recently it has been a neglected, undetected condition. Care has therefore often been absent or inadequate. The failure to make a diagnosis not only meant that treatment was often poor, but also that patients and their carers were not given proper information, adding to their distress. Delirium is also linked with multiple medical complications, including falls – some studies have shown that delirium is implicated in 50% of falls in hospital, immobility, prolonged length of stay, new admissions to care homes and mortality. The financial costs of delirium are also very large, placing greater strain on healthcare systems. Thankfully, there have been increasing efforts to improve care of those with delirium over the last 20 to 30 years. This has been stimulated by reports such as Who Cares Wins (2005) and the NICE Guidelines on Delirium (2010), important studies and innovations in clinical care, and the founding of new international bodies devoted to delirium, such as the European Delirium Association (2006). Scotland has seen a sea change in delirium care in the last few years. This began with the formation of the Scottish Delirium Association (SDA) in 2011, led by Dr Linda Wolff. The SDA is an interdisciplinary group of healthcare professionals set up to gather and create resources for better delirium care. The focus has always been pragmatic. In 2012 the SDA began a collaboration with Healthcare Improvement Scotland to work strategically to improve delirium care in Scotland. It has been a very productive partnership. Together we promoted greater delirium awareness, ran multiple teaching sessions, implemented delirium detection centred on the 4AT and created new resources such as the TIME bundle for delirium treatment, and a widely used information leaflet for patients and carers. The positive effects of this work have been seen in increasing rates of delirium recognition across Scotland. The work has also been influential internationally. However, while this initiative has certainly made a difference, it was clear that there was still a lot of variation in clinical care in Scotland. From this recognition came the proposal that there should be a new Scottish Intercollegiate Guidelines Network (SIGN) guideline on delirium, to provide a resource that could be applied and audited across the healthcare system. Over the last three years, SIGN (part of Healthcare Improvement Scotland), the SDA and other interested professionals and lay people have worked together to produce this guideline and we are delighted that it is being launched on World Delirium Awareness Day. We hope that this will allow for greater awareness and dissemination of the guideline. I have greatly enjoyed the process of working with co-chair Ajay Macharouthu, the superb guidelines committee, and the excellent SIGN team led by Ailsa Stein. The rigorous SIGN process means that we are confident that for the key questions we have found and summarised the available evidence, producing recommendations based on this evidence or with expert consensus when there was insufficient evidence to inform recommendations. These guidelines provide an opportunity for us to lift delirium care in Scotland to the next level, making it normal care that delirium is detected, early treatment is provided, and that patients and families are kept informed of the diagnosis. We are optimistic that, building on the work of the SDA and Healthcare Improvement Scotland that the guidelines will catalyse a national effort to serve all of our patients with delirium to a high standard. To share NHS Scotland’s learning, information and best practice, the Scottish Government established an NHS Board Global Citizenship Champions Network. Board Champions are staff with experience of global health work who can share their knowledge both locally and more widely. As well as having a role in helping develop the NHS Scotland Programme, network members are ambassadors and local champions for global health work in their board.Through the network, I had the unique opportunity to go to Lebanon and visit Syrian refugee camps on the outskirts of Beirut. At the first camp I visited, the Al-Humdaneeya Camp 024 in the City of Bak’aa, one GP ran the entire medical centre, dealing with the urgent needs of around 300 refugees, many of whom are mothers with newborn babies or young children. 30 – 40 patients a day attend the clinic. Established partnership working with NGOs in Beirut ensures patients in most need can be referred to hospitals for treatment. At two other camps in the area, I helped staff distribute food parcels and much needed mother and baby packs containing simple items such as nappies, baby shampoo, powdered milk and wet wipes. A visit to the Baream al Rawda School in Anjar, provided an opportunity to see the ongoing care and support given to Syrian refugee children attending nursery and Primary 1. As well as teaching pupils English, Arabic and Maths, the school conducts a needs assessment in order to ensure children with extra needs or requirements are catered for. There are plans to conduct psychological assessments in the future. Greater insight into work to help refugees avoid suffering further harm was given at ‘The Pulse Will Not Stop” Conference. Key to discussions was the lack of medicines and equipment, how this directly affects the health sector and impacts the lives of refugees. The conference also explored issues around language and medical attention required by refugees to improve their quality of life, preventative health measures to avoid the threat of epidemics and adopting a package of urgent medical care for those fleeing Syria. Assessing refugees’ healthcare needs by promoting dialogue between stakeholders, health professionals and refugees is difficult due to limited resources. In particular, the ability to access healthcare at point of need is scarce and limited in scope. The landscape is further complicated by a combination of reduced funding, an increased influx of Syrian refugees and the presence of Palestinian refugees also residing in Lebanon. Yet there is a determination to engage with communities, recognise inequalities and create a safe and supportive environment that meets individual needs. Every refugee has their own journey. Everyone has personal struggles, losses, hopes, achievements and disappointments. Along with this comes the diversity of unmet mental health and healthcare needs. Trying to ensure quality of care amidst all this is not easy. It was clear to me that the healthcare providers, despite the very difficult circumstances, were dedicated to prevention, improving health and reducing health inequalities. There were positive attitudes in Lebanon towards learning and improving and a real drive to make the quality of care better was very much in evidence. I could see how parts of the Quality of Care Approach could help to support this improvement work. The first fundamental principle of the approach is about putting people who use services at the heart of everything. Care providers were already working on this by trying to deliver healthcare that meets individual needs where they can. The Approach promotes the process of self-evaluation. This is about reflecting on current practice to identify areas where action could drive improvement. 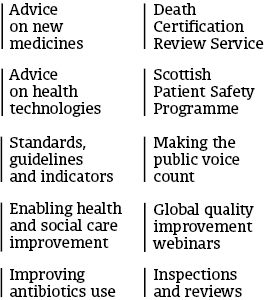 Healthcare Improvement Scotland has developed a Quality Framework to support self-evaluation. There is no reason why aspects of the framework could not be used in Lebanon, in the same way that it is here in Scotland, to drive improvement in healthcare provision and improve outcomes for refugees. Uzma Aslam is a Programme Manager, Quality Assurance Directorate at Healthcare Improvement Scotland. Why an involvement in the pregnancy and newborn screening (PNBS) standards was so important to SBH Scotland. For over 50 years Spina Bifida Hydrocephalus Scotland (SBH Scotland) have supported and provided information to the individuals and families in Scotland who are affected by the neural tube defect, Spina bifida. We also support those affected by hydrocephalus as an allied or sole condition. We work closely with parents from the 20 week scan when a spina bifida parent’s journey begins and no matter where their journey may lead them we are always there. SBH Scotland welcomed an invitation to be involved in offering our feedback on Healthcare Improvement Scotland’s draft pregnancy and newborn screening (PNBS) standards. The standards themselves specify a minimum level of performance for pregnancy and newborn screening services and will apply to all screening services in Scotland, where directly provided by an NHS board or secured on behalf of an NHS board. Whilst the PNBS’s work covers a suite of standards including Fetal Anomaly, Haemoglobinopathies, Infectious Diseases, Newborn Bloodspot and Newborn Hearing, SBH Scotland were asked to feedback specifically on fetal anomalies and their current screening process. In July 2018 we hosted our consultation session for the Healthcare Improvement Scotland team to offer our thoughts based on decades of first-hand experience working with parents and family members who have been through the fetal anomaly process across Scotland. Taking place in our head office and family support centre in North Lanarkshire, the SBH Scotland participants included board members who are medical practitioners, and family support workers who intensively support parents directly impacted by the standards. SBH Scotland have long had concerns over the information which is readily available to expectant mums on spina bifida at the point of diagnosis during the fetal anomaly scan. As this takes place, at the 20-week mark, it is half way through the pregnancy. Choices are given as to whether the mum-to-be would like to continue with the pregnancy and any decisions have to made expeditiously, and, in many cases before the mum has been to see a specialist to discuss the scan in further detail. In the 12 months prior to the consultation our East support team had independently started small focus groups with mums on the topic of ‘experience at diagnosis’ in the hope of being able to influence change in the current system. We were able to share our qualitative information which showed that SBH Scotland families’ experiences have not always been positive in terms of factual and current information being delivered. We believe strongly that wherever an important decision is to be made then informed choice is paramount. I was so proud to see the passion of our staff, and the care they have for our families shone through in discussions. I hope that by being involved in this consultation process that we have eloquently advocated for our parents. It was certainly an incredibly positive experience for our staff team and board members to have their knowledge and experience recognised and I feel the continued inclusion of third sector organisations in such consultations should be of paramount importance. With the knowledge that the standards have been published, I am hopeful that our input, alongside a range of other organisations, will make a positive change for future generations of pregnant women and their unborn children. Andrew H D Wynd MBE – Andy Wynd has spent most of his working life in the Scottish voluntary sector, supporting children, young people and families. He joined Spina Bifida Hydrocephalus Scotland (formerly known as Scottish Spina Bifida Association) in 1989 and is their Chief Executive and Company Secretary.